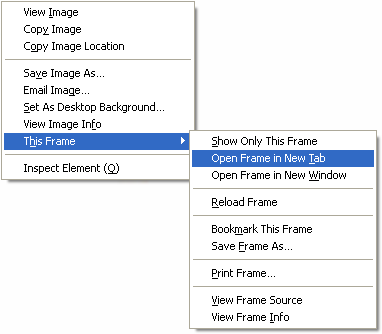 Escape from frames… with Firefox! Frames are useful to embed content located on another page or from another website. They’re also problematic: bookmarking pages with frames is worthless since the content most likely won’t be the same (due to menu navigation usually). When teaching computer class to newcomers, among the first things I tell them when using ANY computer is that Right-Click is there best friend. Firefox is no exception. So all you gotta do is right-click on web pages and when you see frame options, simply open it in a new tab then bookmark THAT page.